JJ Best Banc & Co. Recognized as the leader in the Classic Car automobile finance industry, JJ Best Banc & Co. offers long terms and low rates, financing is available for most model cars ranging from 1900 to today. Fast loan approvals and up to 90% of the vehicle purchase price from a licensed dealer such as Wagoneer World. Buyers are always encouraged and welcome to visit us on site in Texas and drive away with your dream wagon, however we know this is not always practical. Because we sell more than 90% of our Jeeps outside of Texas (most sight unseen), we also ship via auto truck transporters more than 90% of our Jeeps (most sight-unseen). 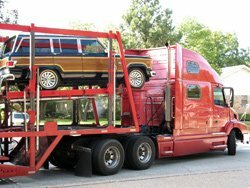 We are happy to handle all the details in shipping your new Cerfitied Wagoneer World Jeep Grand Wagoneer. We have several preferred transporters who are insured/bonded that we work with on a regular basis. Or if you have a transporter of your own we will be happy to work directly with them to ensure safe delivery. A general rule of thumb on transportation costs are 50 to 70 cents per one-way mile. If you don’t know your distance from Wagoneer World in the metro Dallas, TX area check Mapquest to figure your distance from 75080 zip code (Richardson, TX). You can always be assured transporters we work with are reliable, honest, insured and reputable.